Back in 2013 before Tech Elite was founded, Scott Linden Jones was consulting to other companies to help them establish effective offshore teams. His book The Third Wave was also showing how the ‘outsourcing’ industry was set to change the way businesses of all sizes operated. Scott had developed a consulting methodology which identified and resolved all the reasons why companies failed with offshoring strategies. When Scott and partners founded Tech Elite, that unique consulting content became a part of how we help clients succeed at multi-shoring. One of the consulting topics addressed a fundamental lack of understanding with offshoring models. Most people understand a couple of models, such as work-from-home and a “Call Centre” model, but are unaware that there are currently nine different outsourcing / offshoring models. Each of those models has it’s own strengths and weaknesses when applied to a specific business’s goals with offshoring or outsourcing. Or, to put it another way – only one or two of these models will actually work for your specific situation. 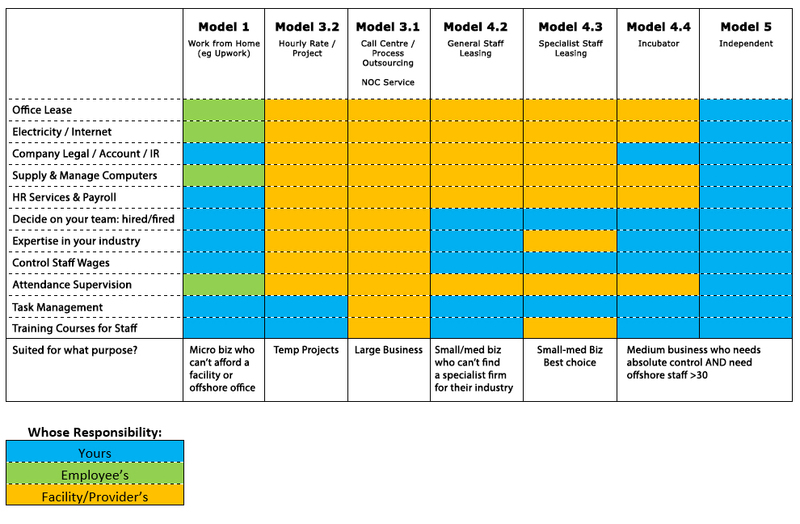 The table above shows just how different the models can be, contrasting 7 common models, and showing which parts of the “outsourcing” are your responsibility to execute. Note how the term “outsourcing” doesn’t really apply to many of these models. One person working from home for you is more like an employee than an outsourcing of anything. Similarly, a facility where you control all the work and management of the staff could be called “offshoring” but it isn’t really “outsourcing”. The terminology that people use tends to reflect their understanding of offshoring strategy. If a potential client is talking to us about “outsourcing” in a way that suggests they expect us to control the quality of outputs from staff, then we know they need some help with their strategy. The only models that are truly “outsourcing”, are ones where you can’t choose the staff, don’t know the salaries, and don’t manage the hourly output of workers. It’s important to understand that the nature of some of these models makes them very difficult to scale. For example, the “Work-from-Home” model is very popular because it’s cheap, and websites like Upwork and Design Crowd make it easy to find millions of willing workers. For some kinds of projects this model can work really well – it has its place in the outsourcing ecosystem. Although it’s the cheapest model, that’s partly because the cost of infrastructure is forced back upon the employee. In places like the Philippines that means unreliable internet, no guarantees of power, no fall-back during outages, and computer repairs that happen on “island time”. In many countries where wages are cheap, many family members live together in a small house. It’s very hard to be productive with 10 of your family running around. It can also make for noisy voice and video calls. Many workers soon realise that they can be working for you while working for someone else simultaneously because there is no effective supervision. They can double their income and halve their productivity and often their boss won’t notice because they aren’t tracking productivity or have low expectations. Sure, you can get screenshot software, but are you REALLY going to trawl through hours of screenshots trying to catch them out? Besides which, a second computer immediately invalidates those checks. In-office supervision has a clear advantage. Team dynamics and culture take their own route, as your onshore team culture is very difficult to infuse across an increasing number of staff working from home. Typically you end up with staff spread across the Philippines or elsewhere, and those staff are too far apart to ever collaborate face to face. Each offshoring model has it’s own advantages and disadvantages. But how would you know what they are if no one told you? The staffing models content that we are drawing from in this article, is a unique insight from Easy Offshore which has instantly clarified the best strategy and prior failure reasons, for many of EOS’s consulting clients. Please feel free to contact us for a copy of the report. Our model is called Transparent Specialist Staff Leasing. It’s one of the fastest growing and most successful models in the Philippines, due to how much control you have over aspects which affect quality of output (like recruitment, process delivery and salaries) , and how little care you need to have for aspects which are too distracting and time consuming to do yourself (like office setup, internet redundancy, payroll and HR legislation). Staff are selected and trained by you to follow your processes – you control the quality of output. You keep control over salary and hiring decisions – wages have no markup and are invoiced at cost. This means that you have career and salary conversations with your offshore staff the same way you do with your onshore staff. They are all humans who want you to care for their career. The facility will look after Office environment, internet, power, security, HR, payroll, and similar things which are all important but which don’t warrant your time and effort to manage yourself unless your team is very large. NOTE that all facilities are different in the QUALITY of these services delivery. For example, just because they have a Staff Leasing model, does not guarantee that they are any good at ensuring that internet redundancy is fool-proof – bandwidth control and security are often done very poorly because facility owners have no knowledge in that area. So clients end up with choppy internet or dropping calls or security breaches and the facility just blames it on the Philippines’ infrastructure instead of their own poor management. Similarly, many facilities charge employees an incorrect amount of withholding tax, leading to an audit or legal action years down the track. Truth be told, most facilities are not very consistent or knowledgeable with how hard it is to run a facility in the Philippines. There are a LOT of startup Australian, New Zealand and UK firms which have good intentions but terrible execution. So the keypoint is that whatever model you choose, you still need a highly competent provider to get the best from offshoring. Our kind of of facility takes the benefits of Staff Leasing but takes things one step further. This model has only existed since around 2013 but is now the fastest growing model because these facilities intimately understand a specific industry. On the diagram above, compare Models 4.2 and 4.3, and note the extra aspects that a Specialist facility can take care of for you. Those two little squares can make an ENORMOUS difference to your result. In industries requiring complex staff skills, knowing how to recruit talent, spot the skills gaps, and fill those gaps, can be the difference between a client failing or succeeding. If a facility specialises in Australian Accounting firms for example, then they know exactly what skills an accounting firm wants to hire, and they know what skills gaps are present locally, and how to fill those gaps to help their client succeed. A generalist facility will simply not have that level of insight (although they might say they do, or appear to have clients that have succeeded). Tech Elite are experts in the Technology industry, and we understand what tech teams need to be successful. We are also very good at hiring other non-IT roles which are considered complex in nature. For example graphic design roles, construction industry roles like estimators, and transcription roles that require medical knowledge. We can of course hire customer service, admin, sales and other simpler roles which do not require industry expertise in order for clients to succeed. OR take a look at our solution and pricing, and please get in touch!